While there are many wine fairs in Spain, they’re generally a spotty affair wherein the winemakers pay a great deal to attend, the attendees have to buy booklets of “drinking” tickets that make each tasting very expensive, and the only people that really win out in the end are the organizers. In France, the general set up is a bit more loose and while it’s impossible to guess how much wineries pay to attend, if you come to taste you pay somewhere around 5€ for the glass that you get to keep and you taste what you want until you head home. That and French fair attendees actually buy wines from the winemakers as the prices are better than in the shops and they’re drunk as seen in the photo. All of this was the case with a little event we heard about just across the border in Argelès-sur-Mer called, Vin’Aqui. The name played on using Catalan instead of French and had the double meaning of “wines from here” as well as a “come here” due to it being organized by the Cavistes Catalanes. Indeed, clever. The space of the wine fair was nothing more than a modern conference hall but it was a quite wonderful location overall with the foothills of the Alberes rising up above and the old Château Valmy sitting at the base of them with Mediterranean Sea washing up just below. The weather was unfortunately squalid with clouds and the threat of rain but the potential for scenic greatness was easy to see. Being greeted at the entrance by someone running around in a donkey costume was far less odd than the bagpipers as the latter have no real relation to the region. For those unaware, what is now the French department of Pyrénées-Orientales was historically a Catalan region called Rosselló (now Roussillon in French) and you still find some older Catalan speakers here and there although French has long been dominant. This was all just to state that the donkey, the revered Catalan mascot to counter the Spanish bull had his place and the bagpipers, not, thus we ran to the furthest corner of the fair to escape their wheezing melodies. There we encountered Jonathan of Domaine Treloar who is making wines that taste a great deal more how it seems like the region should taste to me. We had recently tasted all of his wines at the cellar (and owe him a full profile) and so after a short chat, we left him to enjoy the repercussions of a 50th anniversary party at a neighboring winery the night before. Then the tasting began of what were mostly Côtes de Roussillon wines with a little Colliure and Banyuls tossed in as well. Banyuls and to some extent Colliure are solidly defined and even have a good degree of fame, Roussillon is something of a mixed bag AOC in France. There wasn’t any hard characteristic to come away from tasting 20 or so cellars of the 40 present other than the fact they try a bit of everything and the whites made with Lledoner Roig (Grenache Gris or Grey Grenache) and Macabeu had wonderful acidity and freshness. There are younger, fresh red wines like some of Jonathan’s and those made by Mas Bécha but then there’s the older style of more extracted, heavy new oak like Domain Singla whose younger wines are definitely much more approachable and “definitive” of the area. 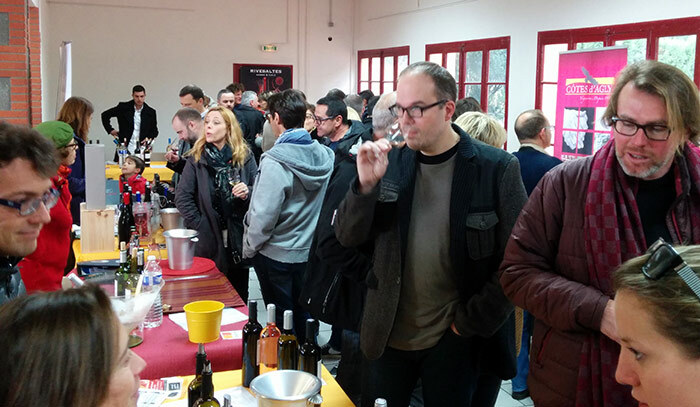 More tasting will be needed as it seems in Catalonia there has been a resurgence of interest in the wines of this French region. This is probably due to distributors looking to expand their profiles as most winemakers in Catalonia already have representation and the wines of Roussillon are probably some of the few within reach by car that are similar in style to Catalonia as well as price. That and they’re starting to come out from under the dark cloud of mass produced glop that was so typical only one or two decades prior. Also, many thanks to the organizers for getting both a charcuterie wagon to come up to the fair as well as the artisan French burger truck L’authentic 66 that was no end of delicious.